ChemDAQ’s Steri-Trac Gas Monitoring System provides the optimal solution for workplace safety assurance, utilising configurable alarms and a module design for continuous detection. The steri-trac detectors are configurable to support 28 different gases including Peracetic Acid, Ethylene Oxide, Hydrogen Peroxide and Ozone, with each individual detector showing the readings for its dedicated area. 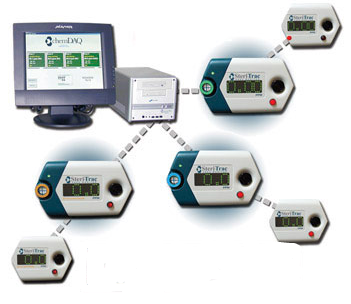 The use of ChemDAQ’s SXP utilises exchangeable EnviroCell™ Sensor Modules for reliable and accurate gas readings. The program provides factory calibrated sensors at regular intervals, ensuring your unit is always working at is best. ChemDAQ’s DAQ Central Monitoring System is a PC based data acquisition program designed to provide real time tracking and display of TWA. The food and beverage industry works to ensure that food stuffs are preserved properly for shipment, providing consumers with an ongoing supply of processed food, rich in taste and colour, and free of bacteria. Disinfectants such as hydrogen peroxide, peracetic acid, and ozone, as well as refrigerants like ammonia are frequently used. As a result, gas detection is an important part of the everyday safety requirements for these processing facilities to ensure a safe work environment. ChemDAQ’s Steri-Trac® toxic gas monitoring system provides a means to monitor ambient air in the work place and help ensure a safe environment. Steri-Trac® Area monitors, in conjunction with Remote Display Repeaters and ChemDAQ’s DAQ™ Central Monitoring System continuously gather, analyse, report and display exposure values in areas where dangerous agents are used or stored.